The Beaufort Scale is is the international measure of wind at sea, where distances and speeds are usually measured by the nautical mile. One nautical mile per hour is called a knot. One knot is 1.85 kilometres per hour or 1.15 land miles per hour. The force of the wind increases as the square of its velocity, so each new step up on the Beaufort Scale is a whole new experience at sea. The pressure of the wind on you and your kayak increases proportionate to the square of wind speed so a wind of 10 knots is no big deal, but a wind of 30 knots will test the quality of your paddle and spraydeck and could even kill a kayaker whose ambitions go beyond his experience. However 30 knot winds (Beaufort Force 7, a near gale) are unusual even in winter. The best answer if your partner wants to go kayaking in a Force 8 is probably "Great, I'll try to take some pictures. Leave me the car keys." Force 0. Calm. No wind. Sea like a mirror. Novice kayakers are very happy with this exciting new experience. Force 1. Light air. Wind speed 1-3 knots. Ripples on water. Sailing bboats don't have enough wind to move. Novice kayakers are still happy. Force 2. Light breeze. Wind speed 4-6 knots. Small glassy wavelets. Yachts sail along very gently. Some inexperienced kayakers may start to get a little anxious. Force 3. Gentle breeze. Wind speed 7-10 knots. Large wavelets, white crests begin to form. Sailing yachts make slow but steady progress, water gurgling along the side. If you are going to windward, the wind will slow you down a little but intermediate kayakers are still happy. Force 4. Moderate breeze. Wind speed 11-16 knots. 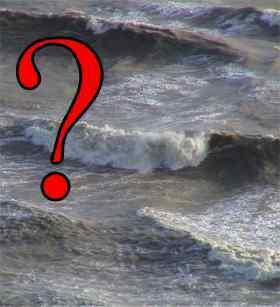 At sea there are waves 1 metre high, some with the breaking crests called whitecaps or white horses. Experienced dinghy sailors have a great time. Yachtsmen start to get a buzz out of being at sea. Short sea trips are possible for intermediate kayakers but they may feel anxious unless they're near the beach or with a strong group. When crossing exposed waters with the wind coming from the side, a kayak without a skeg or rudder is likely to weathercock. Probably there is good surf, but if the wind is blowing onshore it will be getting mushy. Force 5. Fresh breeze. Wind speed 17-21 knots. Ashore, small trees in leaf begin to sway, and on exposed sites such as headlands and long beaches this is a noticeably windy day. On sheltered waters, experienced dinghy sailors are going at top speed, hiking out to the max or using the trapeze to keep the boat upright. On the open sea, there are few small powerboats to be seen. Sailing yachts find it wet going to windward. They start taking precautions and most of them head home. Waves may be 2 metres high and there are many white horses. 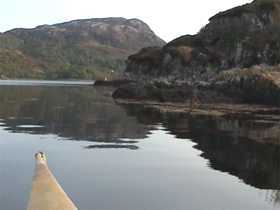 Intermediate kayakers stay in sheltered waters. 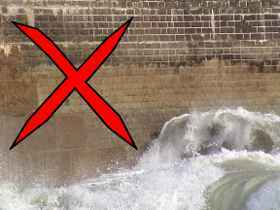 On exposed waters, experienced kayakers will be in a high state of alertness, knowing that there may be the occasional heavier breaking crest and that it would be difficult to carry out a deep-water rescue. They will find it wet and hard work to go upwind. Some kayaks will weathercock badly unless fitted with a skeg or rudder, making it difficult or impossible to keep it on course for more than 30 minutes. If you stop and rest for a few minutes you will drift hundreds of yards downwind. Surf may be good, but it may be blown out and a waste of time. Unattended paddles roll off up the beach. Force 6. Wind speed 22-27 knots. In the countryside, large tree branches are in motion. In the city, it is difficult to use an umbrella. 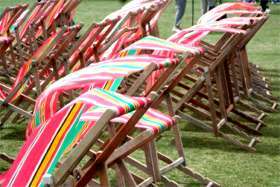 At the beach, surf is probably blown out and unusable, and empty kayaks may roll away if left unattended on the firm sand down by the water. At sea there are large waves everywhere, with continuous white horses. The Beaufort Scale was written for square-rigged sailing ships which considered winds of this strength to be a "strong breeze" but this is a yachtsman's gale. The occasional stronger gust will be enough to flatten a small yacht. Any remaining yachts and small powerboats head for home. Short sea trips are possible for expert sea kayakers, who will find that three miles directly into wind and waves is more than enough. Going downwind is a fun sleigh-ride for experts. Deep-water rescues are now difficult, so if you can't roll your kayak every time maybe you should not be out. Towing a casualty is also difficult even for experts. If you get into difficulty and call the lifeboat, flying spray and rough conditions may make it difficult for the lifeboat to see you. Force 7. Near gale. Wind speed 28-33 knots. On land, whole trees are in motion. When you walk upwind, the strength of the wind is an inconvenience. On the open sea there are large waves, but surf is blown out. Empty kayaks can roll up a hard sand beach as fast as you can run. Some ferry services are cancelled. Any yachtsmen still at sea are thinking seriously about their options. They have two reefs in, they've secured all loose objects and sealed the ventilators. The person at the helm probably expects to be replaced every thirty minutes. A sea kayaker on exposed waters in Force 7 or above is likely to be in real trouble. Even top experts are approaching the limit. Force 8. Gale. Wind speed 34-40 knots. Ashore, the wind breaks twigs off trees and makes life difficult for people on foot. Some damage to property is likely. On exposed campsites some tents are blown down. At sea, visibility is obscured by flying spray. Except in the most sheltered water there are large breaking waves. On sheltered water, a kayak going upwind will come to a halt between each paddle stroke and the next. Yachtsmen heave to rather than try to sail upwind. If they're near a lee shore they get on the VHF radio to the Coastguard. Newspapers report dramatic lifeboat rescues. Much commercial shipping is at anchor in sheltered waters. Force 9. Severe gale. Some damage to buildings. Slates blow off roofs. Force 10. Storm. Wind this strong is seldom experienced on land. Some trees are broken or uprooted. There is considerable damage to buildings. The waves described above are those which would develop on the open sea when the wind has been blowing consistently for some time. 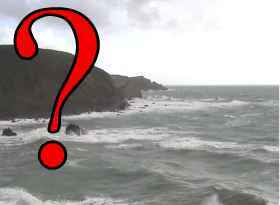 In sheltered waters there may be no significant waves until Force 5 or even Force 6. 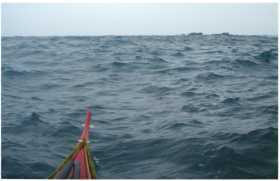 The word leeway usually refers to a boat drifting sideways, blown by a side wind, so that its actual course is (say) 10 degrees from its heading. Any boat or even ship will make leeway when there's wind from the side. A kayak drifts fast because it is very light and doesn't have much to grip the water. A Force 4 wind can blow a stationary kayak sideways at 1 to 1.5 knots. The practical solution if you're navigating in open water is to keep an eye on your destination using transits, and ferry glide straight there. If you're a serious kayak navigator and you can't see your destination, you could recalculate to make allowance for it - if you knew how much leeway you were actually making. Unless you have GPS, any estimate of leeway is going to be very approximate. 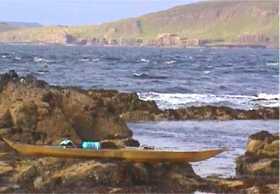 Gordon Brown in his book Sea Kayak (Pesda Press, 2006) tells how he and a friend were hit by a powerful squall between Islay and Jura, and they could only put their heads down and wait. They started almost alongside but when the first gust subsided it left them more than 500 metres apart. Different kayaks, different drift. • how much your own personal autopilot corrects your course for wind and waves by unconsciously paddling harder on the downwind side. That's likely to be the biggest factor. We can make some attempt at calculating the amount of force that the wind exerts on a kayaker. The Weather Station of the University of Sussex has an online a table showing the wind pressure which exists on a flat vertical surface in winds of different forces on the Beaufort Scale. Click here to view. The kayaker in this diagram is overlaid with a 10 cm grid. Count the squares. We make it 115, so 1.15 square metres. The table indicates that a Force 5 wind blowing from the side would exert a constant force of at least 8 kg. That is a lot, and it must mean a fairly rapid sideways drift. A kayaker can apply a force of 16 kg or more with his /her paddle but you don't normally apply a force of more than 6 kg to paddle forwards. Maybe now you've got a force of 8 kg that's trying to push you somewhere you don't want to go. Of course, the only reason the kayaker in the diagram is a flat vertical surface is that he's not real. He's just a two-dimensional profile, but wind resistance is really about three dimensional shapes which are more or less streamlined. A large but streamlined object such as a 6-metre long aircraft wing can have the same wind resistance as a 6-metre long rod which is only the thickness of a finger. The shape of the rod creates a lot of turbulence. Compare these hypnotic YouTube videos of high and low Reynolds number flow over a wing and a rod. A kayak is a streamlined shape, but when you add a kayaker and a paddle the complete package is not streamlined at all. Try holding your paddle up in the air the next time you're in a Force 5 or 6. You can really feel the wind grab hold of it. In a Force 5 side wind some kayak + kayaker + paddle packages will drift sideways at walking pace. If your kayak has high volume; or there is clutter on the deck such as a deck bag, fishing equipment and a helmet you are not using; or your paddle is longer than necessary, you will find the wind is more of a problem than if you are in a low volume kayak and have a streamlined profile. Most sea kayaks weathercock in high winds. They constantly turn to windward. A lot of sea kayaks are fitted with a skeg or rudder to prevent this. You've also got wind-generated waves to think about. Even if you're in a well-designed sea kayak, control starts to become an issue in high winds, so you're not likely to be doing any fancy navigation, but it's still worth thinking about leeway. 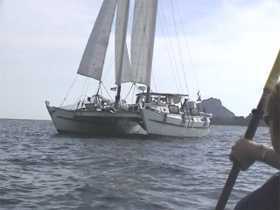 Another factor in navigation is wind-induced current. A wind which blows continuously for several days over open water will create a surface current of up to 2% the speed of the wind. So a Force 5 wind may create a surface current of up to 0.42 knots.